Here you can read the rules and the disclaimer. Introduce yourself or say farewell for a while. 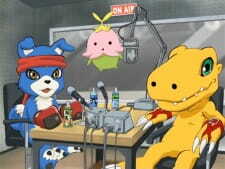 Talk about anything related to Digimon. Talk about other stuff here. Everything related to the RPG is located right here. If you are new, you must complete this tutorial in order to play the game. Read the basics of the game while doing the tutorial. Here you can create and check your Tamer's profile. Here you can switch Digimons and arrange your party. You can imagine yourself battling in the animes. Battle and compete in Dracomon's Arena. Here you can digivolve, convert DATA and more. Everything about this world is stored here. The Mamemon and Brothers can offer you a plenty of services. Buy and sell items at the market. Here you can roleplay with your Tamer and Digimon. Are you ready to take the missions that await you? The leader of D-City is right here. The Black Tortoise is in charge of this hot and cold sector. The wind here is blown by the Azure Dragon. The White Tiger roars in the greatest deserts. The fearsome Crimson Bird raises its wings at the top of the volcano.